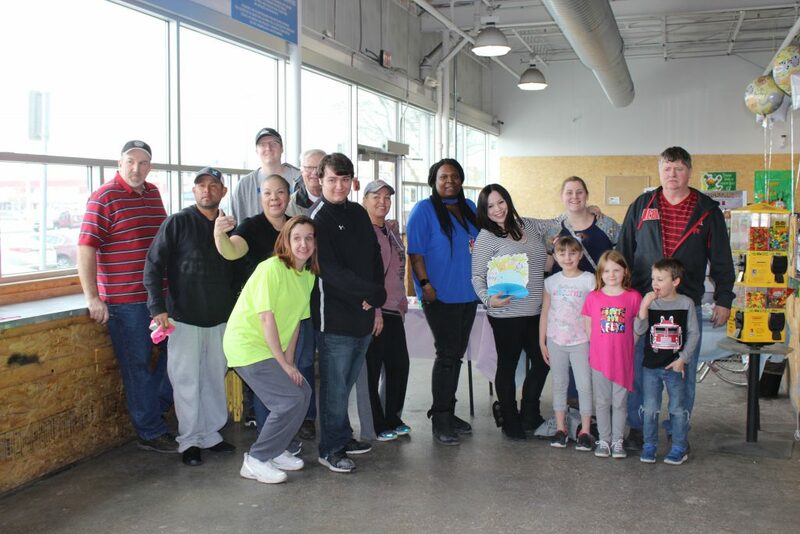 It is not every day that Goodwill hosts a gender reveal party for an expectant mother. On March 7, 2019, that is exactly what happened at Goodwill’s WearHouse store on 72nd & F where long-term customer Arelys Sandoval revealed the gender of her next child to her family, friends and fellow shoppers. Shantel Featherson, Goodwill’s WearHouse Manager, was honored to be part of the special occasion. “We were so excited to be part of this special moment for one of our long-time customers. We were able to help celebrate with great people, good food and games,” said Shantel. Shantel took time out of her busy day to plan the party and purchase decorations to make this day extra special for Arelys. Arelys’ brother, Rodrigo, introduced her to the WearHouse store over eight years ago and she has been a regular shopper ever since. The WearHouse store is a different kind of shopping experience. Items not sold at the traditional retail stores are sent to the WearHouse and most items are sold by the pound. Arelys is a stay at home mom and sees her daily trips to Goodwill as a way to make new friends who enjoy shopping at the WearHouse as she does. Arelys says the friendly and helpful employees at Goodwill make her daily shopping there a memorable experience. “I really appreciate the environment at Goodwill, everyone is so nice!” said Arelys. Sandoval’s favorite things to shop for are clothes and toys for her son Ivan. A budding entrepreneur, she enjoys shopping for books that she resells on eBay and Amazon. “I always find great stuff!” said Arelys. Arelys said her gender reveal party is by far the fondest memory she has of all her trips to Goodwill. The WearHouse staff looks forward to her bright, cheery and pleasant demeanor every day! Goodwill is grateful for Arelys sharing her special day with us. We appreciate her loyalty to Goodwill and cannot wait to meet the newest addition to her family. Goodwill supports community needs and provides a unique shopping experience for customers like Arelys who has become a member of Goodwill’s extended family! And the gender was… A BOY!!! We would like to say THANK YOU to all of our customers! Because of loyal customers like you, in 2016 Goodwill has been able to provide over 22,000 employment services to people in our community. Please join us for a 2-day sale! All customers will receive 10% off, and if you are a Goodwill cardholder, you’ll receive 20% off! During our sale we will be having popcorn, refreshments and we will be doing merchandise credit drawings, goody bags and coloring pages for children. And don’t forget to also sign up for our big giveaway! Two lucky winners from each store will receive 20% off for a whole year!